A sample of the many pages that had been redacted and sent to Sussex County Freeholder Gail Phoebus' counsel per an OPRA Request. Assemblyman Parker Space and Freeholder Gail Phoebus, a candidate for Assembly, today called on the Sussex County Freeholder Board to formally end their relationship with Steven Pearlman and Gabel Associates. Two weeks ago, Morris County Freeholders and the county’s improvement authority forced the resignations of Pearlman, the attorney who was called the “godfather” of the “Morris Model” solar program, as well as Gabel, the company that advised on solar-energy prices which collapsed as the project was being built. Other members of the Sussex County Evaluation Team included two representatives from North West Financial Group; two from the now-disgraced Birdsall Services Group, which pleaded guilty to public corruption charges and was fined millions; as well as Sussex County Administrator John Eskilson, Sussex County Attorney Dennis McConnell, and Sussex County Treasurer Bernard Re. “It is time for Sussex County to follow the example of its neighbor, Morris County, and end its relationship with these vendors,” Freeholder Phoebus said. Freeholder Phoebus expressed her frustration in trying to obtain exact figures on what these solar consultants have been paid by Sussex County. As an elected Freeholder, Phoebus should have access to all receipts and invoices that concern the spending of taxpayers’ money. But in her search for answers to why the solar project melted down, Freeholder Phoebus has been denied documents that should have been turned over to her by top county bureaucrats who are supposed to be answerable to the elected Freeholder Board. “I have had to hire an attorney to make Open Public Records Act (OPRA) requests for the information due me as an elected Freeholder,” Phoebus said. 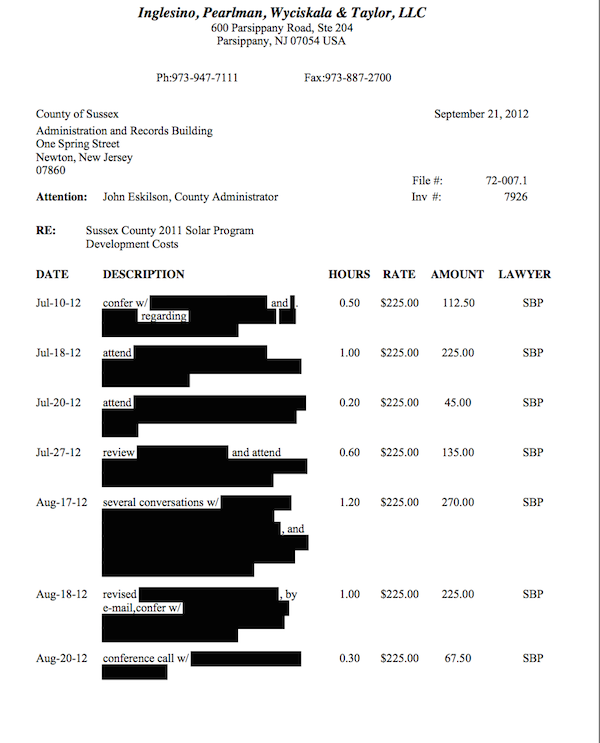 In answering these open records requests, the unelected bureaucrats who apparently run Sussex County have brazenly redacted most of the details from the billing information, so that it is impossible for even a Freeholder on the Capital Budget Committee, like Phoebus, to know why and for what county taxpayers are paying these solar consultants many hundreds of thousands of dollars. A sample of the many pages that had been redacted and sent to Sussex County Freeholder Gail Phoebus’ counsel per an OPRA Request. 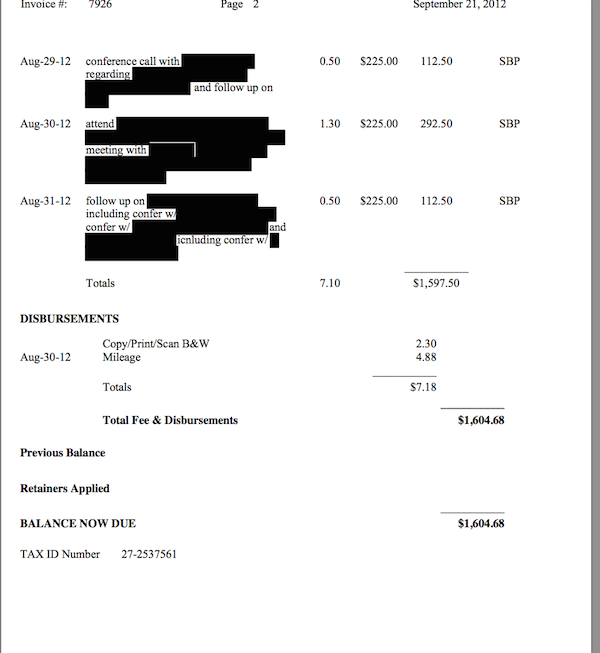 Editor’s Note: This is the second page of a Sept. 21, 2012 invoice sent to Sussex County Administrator John Eskilson, which was heavily redacted when Sussex County Freeholder Gail Phoebus’ counsel requested it. Now a new twist has come to light. In an exchange between Freeholder Phoebus’ attorney and Sussex County’s top bureaucrats, it is apparent that this redaction of information is taking place in concert, with the connivance of both county bureaucrats and solar consultants. “Why are they not being transparent,” Freeholder Phoebus asked. “I want to know what they are hiding,” asked Assemblyman Space. Editor’s Note: Click here to see the full redacted document.